Quito is one of South America's most attractive capitals, and the beautiful colonial architecture of the Old Town made it the first city in South America to be declared a World Heritage Site. 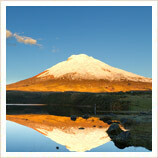 With its winding cobbled streets, grand churches and pretty squares, it's one of the real highlights of Ecuador. There's also a huge cultural scene to enjoy, with particular emphasis on music and dance of all kinds, from the classical ballet and opera on offer at the Teatro Sucre to the regular street exhibitions of indigenous music and dance traditions which you can enjoy in the Old Town. And when you add to this the year-round balmy climate, the superb natural setting overlooked by the snow-capped Pichincha volcano, and the easy access to all the rest of Ecuador's delights, it's no surprise that Quito usually ends up being one of peoples' favourite destinations on our holidays in Ecuador. 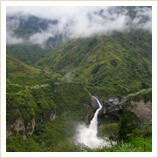 All our holidays and tours of Quito can be 100% tailor-made, so just get in touch to plan your dream trip to Quito. 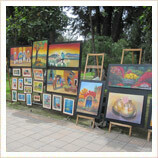 There are two main areas of the city which are likely to be of interest during your holiday in Quito. The historic Old Town which lies in the south of the modern city has the beautiful architecture and historic sights, but many tourists prefer to stay in the modern Mariscal area to the north. Towering over the Old Town is the "Virgin of Quito" statue which sits atop the nearby Panecillo hill and is believed to act as Quito's guardian in times of trouble. It can be quite handy to have a landmark in the maze of little streets, so being able to look up during your trip and see your celestial guide wherever you find yourself can be very useful indeed. The main downside to the Old Town is the lack of hotels and other facilities. Although there are some superb high-end hotels in the Old Town (such as the Patio Andaluz and the Plaza Grande) there is a real lack of more 'standard' options and the choice of restaurants and other facilities for your evenings is also rather limited. For this reason, many people choose to visit the Old Town on guided tours of Quito but stay in the Mariscal area slightly to the north. This modern district has much more in the terms of facilities but it's also a really nice area generally in which to stay, with the lovely green El Ejido park just at the bottom of Avenida Amazonas, which is the main street. It's a great area to just stroll around, and enjoy sitting in the pavement cafes, and also offers the pick of Quito's hotels. Quito's new international airport lies just over an hour's drive to the east of the city, replacing the cramped facilities at the previous international airport in the north of the city. There's no doubt that the airport is a big improvement, but it does mean a lengthy travel time to and from either the Old Town or the Mariscal so if you're flying out early the next morning you may prefer to end your holiday with a stay in one of the redeveloped haciendas around the airport. 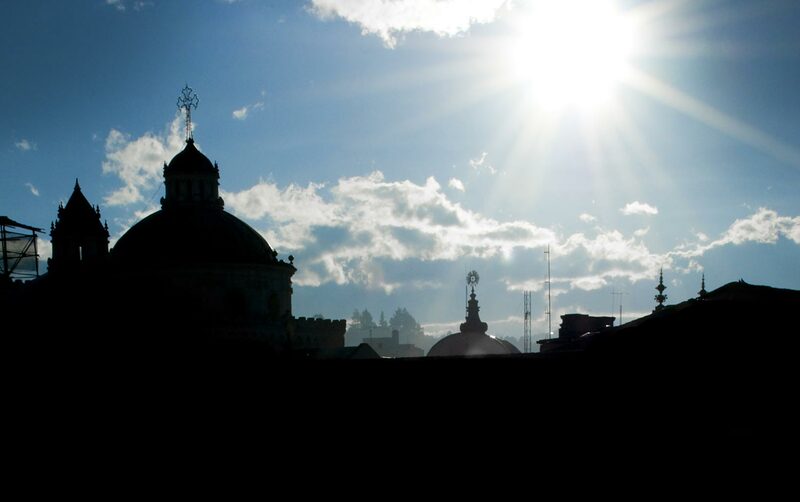 Quito is very much a city of two halves. The Old Town is one of the prettiest and most elegant reminders of Latin America’s colonial past, while the pavement cafes, restaurants and bars of the modern, bustling, cosmopolitan New Town would be at home in any European city. Taking a trip between these two areas is quick and easy, whether you use the regular and reliable trolleybus and EcoVia rapid bus system, or just hop in one of the plentiful and cheap taxis. The immaculately-preserved and still-buzzing Old Town gives you a real taste of what life in colonial South America must have been like, with its cobbled streets, huge churches on every corner, and grand public squares. Towering over it all, on top of El Panecillo (little breadcake) hill, is the statue of Quito's patron, the "Virgen de Quito". This Madonna figure stands 41m tall, standing atop a globe, and crushing a snake with her feet. There is a great view of the city from the top of the hill. The central Plaza de Independencia is home to many of Quito’s grandest buildings, with the Cathedral, the Government Palace, and the Archbishop's palace on three of its four sides. The all-white cathedral dates from the 16th century and is the oldest cathedral in South America, with ornate carved doors and plaques commemorating the city's founding fathers on the outside. The Government and Archbishop's Palaces are more modern but also of interest: particularly the courtyard floor made of pigs' spines! Within a few minutes walk from the Plaza are some of the most stunning churches in South America, and we heartily recommend a quick visit to them even if that isn’t usually your thing. Arguably the most spectacular is the Jesuit church of La Compañia. It took 163 years to build and was finally completed in 1863. A blend of Baroque and Quiteño art, nearly a ton of gold leaf was used in the decoration and the ceiling in particular is stunning. 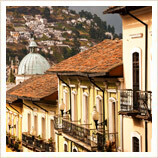 It is often referred to as the Sistine Chapel of South America and forms the centrepiece of many tours of Quito. Also just a block from the Plaza are the monasteries of San Agustin and Santo Domingo, which are impressive buildings in their own right and also are home to large collections of portraits and other paintings from the indigenous Quiteño school – one of the leading schools of art in colonial South America. At least until the new Metro is completed, trips between the Old and New Towns are most easily made in a taxi and won’t cost more than a few dollars but if you're short on time you may spend most of your time in the New Town as this is where most hotels, and other tourist necessities, are to be found. The main street is Avenida Amazonas and this is where you will find shopping centres, banks, and many restaurants and cafes. 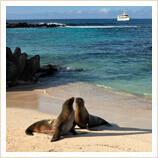 It can be a really relaxed place to just sit back and write your postcards before heading off to do some sightseeing. If you prefer a little more greenery to relax in, then you might also like to walk down to the very end of Amazonas to the El Ejido park, where you can stroll or sit and enjoy Quito's balmy climate. The main area for dining and nightlife is just off Avenida Amazonas and is known as “La Mariscal”. Very roughly bordered by Amazonas and Diego de Almagro to the east and west, and Colon and Patria to the north and south, the area is buzzing at night and offers a really wide variety of cafes and restaurants, plus bars and clubs if you want to stay out a little later. As you would expect, Quito is home to some of the top Ecuadorean restaurants so we’d certainly recommend you try a couple of them while you’re in town. La Choza on 12 de Octubre is one of our favourites: offering a cosy feel but with real quality and all the local delicacies you could hope for. For lunch in particular, you should try Mama Clorindas on Reina Victoria, which is a real homely place with huge almuerzos (set lunches) and a good a la carte menu as well. Later in the evening, the New Town is definitely the place to be, with dozens of lively bars and clubs clustered in La Mariscal, particularly around the intersections of Reina Victoria, La Pinta, La Niña and the surrounding area. Varadero is a good local place with live music and good cocktails, but almost all of the bars and clubs are on the main streets so it’s often best to just walk up and down until you find somewhere that looks like your kind of place. All is not lost, however, as just around the corner, up a dirt track, is the Intiñan museum, which is located on the actual line of the equator (they have the GPS measurements to prove it!) 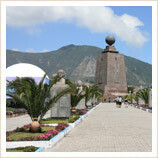 and where you can see all kinds of weird effects involving water and plugholes, egg balancing and all sorts of other oddities which only happen right on the equator. It’s well worth a trip, if only so you can tell people that water really does go round the plughole in a different direction in the southern hemisphere. You can take a trip to the Mitad del Mundo in half a day, but you'll need to allow a full day for the other must-see tour from Quito, the stunning Cotopaxi National Park. Located a few hours south of Quito, this beautiful and unspoilt national park has the snow-capped Cotopaxi volcano at its heart, and a day spent exploring the lovely scenery and seeing wildlife such as the giant Andean condors is well worth your time. Here, and in a couple of locations just outside Quito you can also enjoy trekking, rafting and mountain-biking, among lots of other adventure sport activities. Although many international flights also go to Guayaquil, it's very likely that Quito will be your point of either arrival or departure in Ecuador. 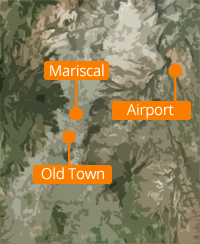 The brand-new Mariscal Sucre airport was opened in 2013 to the east of the city and although the increased transfer time compared to the old airport is a pain, it does mean that you benefit from brand-new facilities. It's also hoped that the longer runway and lower altitude at the new airport will attract more international flights as Quito is relatively poorly-connected to the rest of South America and further afield, although every conceivable destination within Ecuador is covered. At the time of writing you can fly within South America directly to Peru, Venezuela and Colombia every day, with non-daily flights to Buenos Aires in Argentina as well. Sadly there aren't any direct flights to the UK, and all flights from the UK to Ecuador will go through Amsterdam, Madrid, or the USA - frequently with a touch-down in Guayaquil. Quito is also at the centre of Ecuador's road and rail network, so destinations across Ecuador are easily reached by car and you can also benefit from the newly-restored rail line south to Guayaquil via Riobamba and the famous Devil's Nose. 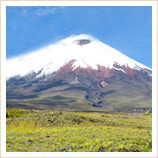 This is a fantastic journey, but there are also several shorter day trips possible by train, either north into the mountains around Imbabura or south into the Cotopaxi National Park. Quito is sandwiched in a deep valley running north to south, and it has to be said that traffic on the few major arteries is not fantastic, and journey times out to the new airport are uncomfortably long, at over an hour each way. For journeys within Quito you can use the plentiful and cheap taxis - a journey between the Old and New Towns will cost just a couple of dollars - or use the Trole trolleybus system or Ecovia buses which run north-south between the Old and New Towns. These can get crowded but only cost $0.25. Public transport is set for a revolution in Quito, however, with line 1 of the new Metro due to open later in 2016. When it does, it will provide a much quicker and easier journey between the Old and New Towns. Quito isn't known as the City of Eternal Spring for nothing, and the climate is surprisingly mild given the city's altitude. Average daily temperatures hover around 20°C but it will feel warmer in the sunshine, particularly in our summer (Jun-Aug). Spring does mean some rain, and the bulk of falls in two rainy seasons from February to May and then again in October-November. It's generally a case of showers rather than it raining all day, but it has to be said the British summer is a perfect time for holidays in Quito. All our holidays to Ecuador are 100% tailormade, so if you'd like to customise any of the Quito tours you see above, or just plan a trip completely from scratch then get in touch and let us know - we'll be delighted to help you plan your perfect holiday in Quito! Although it's the capital, Quito isn't actually the largest city in Ecuador: the coastal commercial hub of Guayaquil is substantially bigger. However, while we love Guayaquil's busy, tropical atmosphere, we think it's fair to say that Quito is much the prettier of the two!